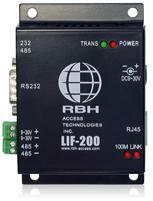 LIF-200 TCP/IP LAN Gateway is an inexpensive way to connect RBH Access Control panels to a host via the Internet or a local/wide area network. Both RS-485 and RS-232 communication are supported and are selectable via hardware switch. The EXITRDR exit reader module is a flexible, convenient and inexpensive way to control and track cardholder access in both directions through the same door. 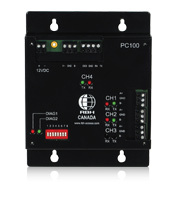 The EXITRDR module is compatible with all IRC-2000 & URC-2000 series of controllers. RBH's PC-100 hardware ASCII gateway is designed make integration with intrusion alarm panels much easier and less expensive than conventional input/output means. 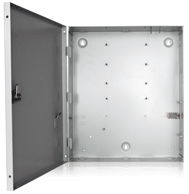 ENCL1 is a robust wall mount lockable enclosure designed to house a variety of RBH controllers. It features a convenient removable cover mounted on heavy duty hinges and allowing 170° swing and lock. Installation is made convenient by a number of conduit access points on all sides of the enclosure. ENCL1 is a robust wall mount lockable enclosure with a built in 2A 12VDC linear power supply with fully supervised backup battery charger. 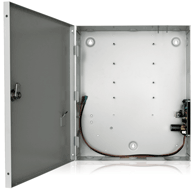 The enclosure is designed to house a variety of RBH controllers and it features a convenient removable cover mounted on heavy duty hinges and allowing 170° swing and lock. Installation is made convenient by a number of conduit access points on all sides of the enclosure. 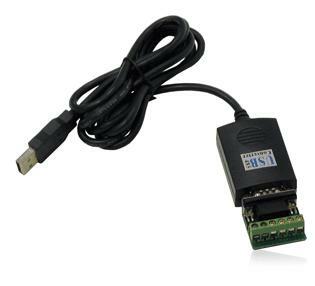 RBH's H485-USB makes any PC, outfitted with an USB, port capable of connecting to the	IRC-2000 & URC-2000 series of control panels and NC-100 series of comunication controllers.